The Riverdale cast is currently filming Season 2 of the beloved Archie Comic turned primetime teen soap opera. The new season premieres on October 11, but until that day arrives, we already know a few things that might happen. Why? Because the cast is very active on social media, and we are putting two and two together. We have no idea what, if any, of the following images are spoilers, so just keep that in mind. But here’s what we do know about Season 2 of Riverdale, based entirely on behind-the-scenes social media snaps. 1. The show’s creator shared this image, which proves that Bughead is still together. After the cliffhanger in the last episode, it honestly seemed like Jughead could become too ~bad~ for his precious Betty. It’s also a direct image from the comics. In the original comics, Betty is a skilled mechanic, so fans should be satisfied to see that playing out. 2. Jughead is still living in his dad’s trailer, aka Jughead is probably a full blown Serpent by now. 3. 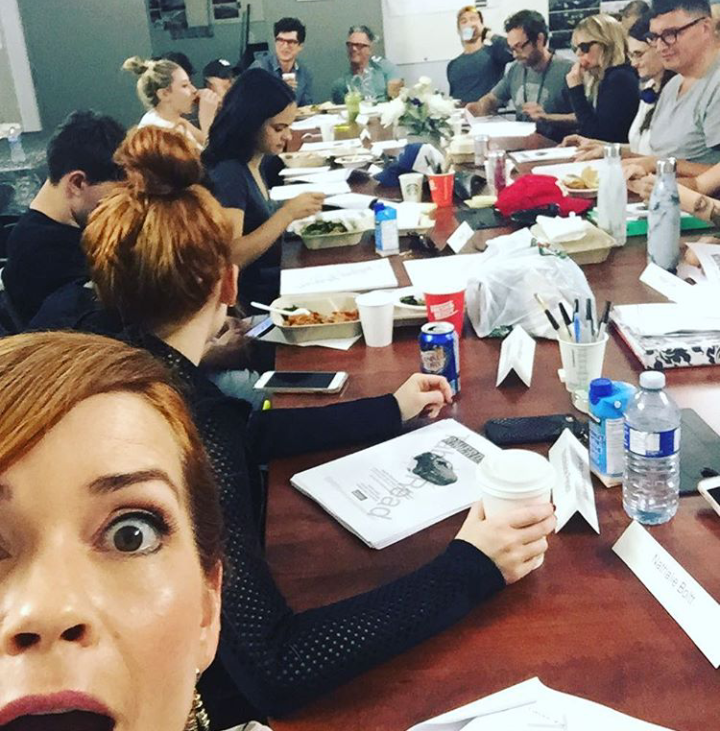 Nathalie Boltt, who plays Penelope Blossom, posted this photo of a table read. At the far end of the table sits Luke Perry. Why is this significant? Because his character, Fred, was shot at the end of Season 1. So clearly he lives! She deleted the photo immediately after posting. 4. Based on this tweet from the creator, it seems like Veronica and Archie’s relationship might not last, but like, that was a given. 5. Betty’s mom goes to jail to visit Jughead’s dad, and omigod what if THEY start dating? 6. This is what Mark Consuelos looks like as Veronica’s dad. So that’s what we got. Did we miss anything?